Microsoft has now detailed what hardware you’ll need to run Windows 10 at its WinHEC keynote in Shenzhen this week. In a presentation about Windows 10, the company revealed that it will require a minimum resolution of 800×600, 1GB of memory for 32-bit machines or 2GB for 64-bit, 16GB of storage space for 32-bit or 20GB for 64-bit and DirectX 9 support. 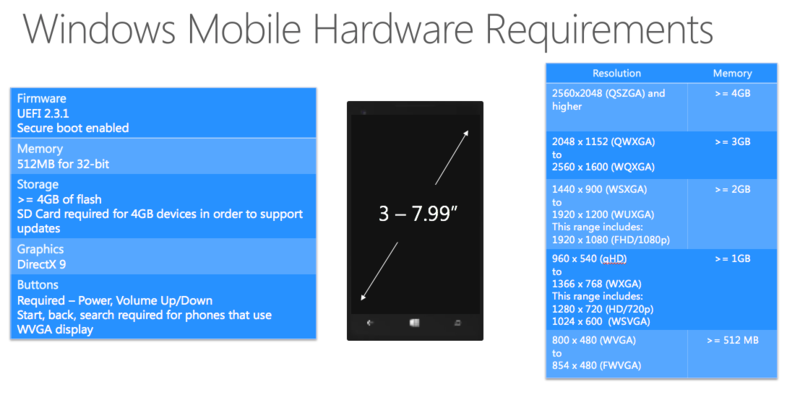 On top of this, Microsoft is requiring physical power and volume up/down buttons on tablets, with a start button or rotation lock being optional. It’s also requiring UEFI secure boot to be enabled by default. While a TPM module for Bitlocker drive encryption is not required at launch, the company will require one for machines a year after the release. The slideshow also detailed that manufacturers should provide a path to upgrade from Windows 8.1 to 10 and ensure their drivers are compatible. In a separate slideshow, it revealed which operating systems can directly upgrade to Windows 10 and how it can be installed. Windows 7 and up can upgrade to Windows 10 using an ISO file, but Windows 7 and 8.1 users with all updates can utilize Windows Update to migrate. For Windows 10 phones, Microsoft will require a different amount of memory depending on screen size, with a minimum of 4GB of storage and secure boot to be enabled. Physical buttons for power, volume/up down are required, but the physical start, back and search buttons are no longer compulsory due to on-screen buttons unless the device has a low-resolution WVGA display. “Project Milkyway” is an interesting new effort to get Windows Phone users updated to the latest release “within 4-6 weeks of release.” It’s unclear if that’s planned for Windows 10’s initial release or for going forward after that. 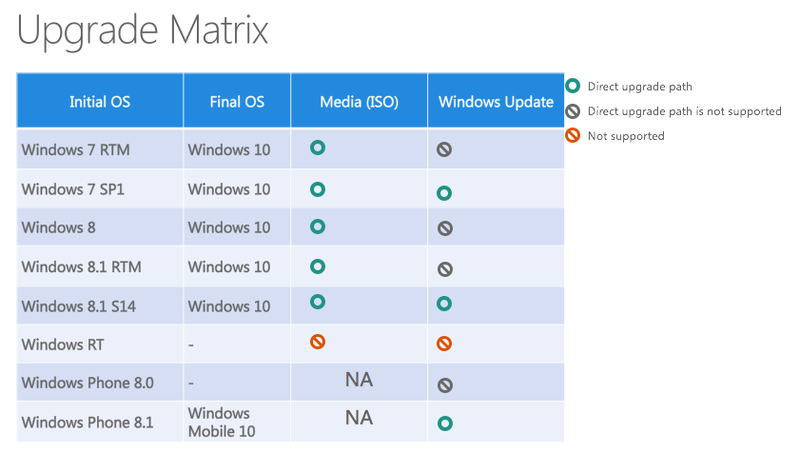 In short, expect Windows 10 to run essentially everywhere Windows 8.1 already does without much hassle.